Buck knife display from hardware store counter top. Vintage and genuine original display from about 1995 that is about 24" X 15-1/4" X 16" on the bottom and the top tapers to about 7-3/4" in excellent condition. It would be used to display knives and has storage in between the two sides for extra back stock. It is marked on the bottom left of both sides Buck Knives and is wood stained light walnut in color. 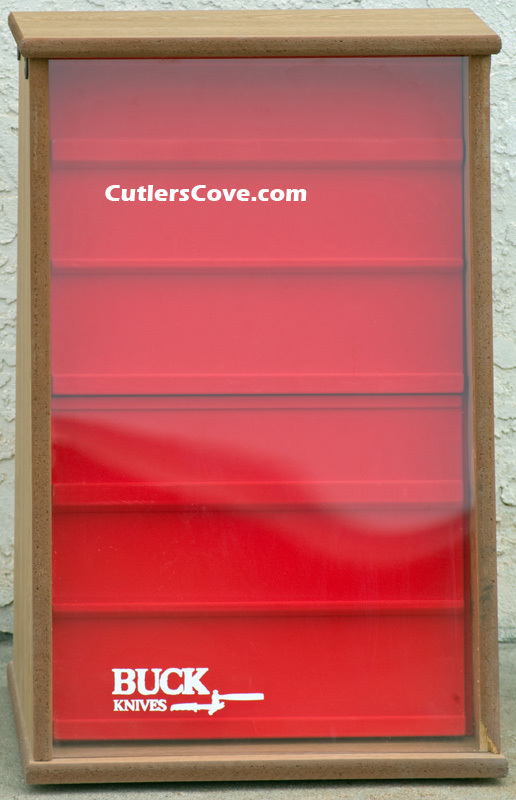 The knife display behind transparent acrylic plastic is a red color. The whole unit is on a large metal Lazy Susan so it can be rotated 360° and you can see both sides displaying the knives. The transparent acrylic plastic has cloud reflections showing and is clear without marks or shapes. We photographed the display outside on an over cast day with clouds. In the red area there are four panels with two shown on each side to hold the knives. The top is removable by loosing four metal hold downs and slide out of the four panels to reach the storage area. All are original. Notice the red panels are in two different layouts to hold several sizes of knives. There are light scratches on both transparent acrylic plastic sheets and on the right lower corner there is a small chip of wood missing and a few other small bumps but other wise nothing is loose or missing. The unit has not been repaired and only lightly cleaned with a dusting cloth. 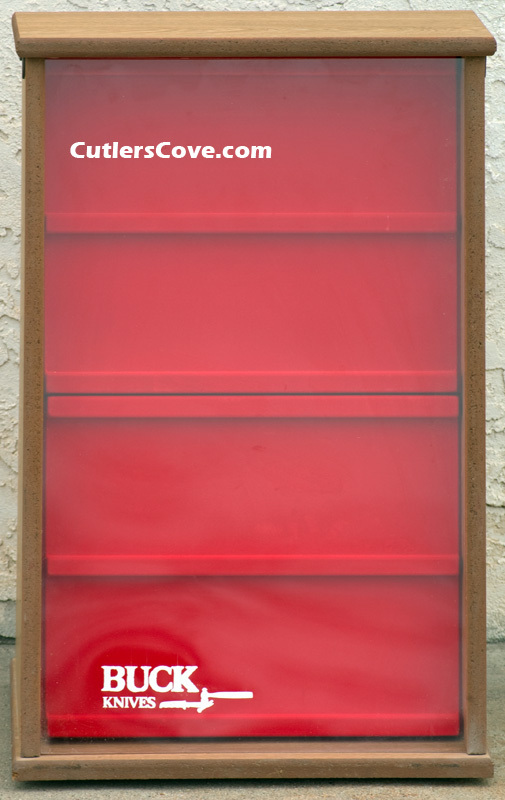 It is as found vintage original condition and has been in the owner of CutlersCove.com collection for about 17 years. CutlersCove.com in white text is on the photos and not on the knife display. Many people use old and vintage knife displays for decoration in homes, offices, log cabins, man caves and to highlight their knife collection. 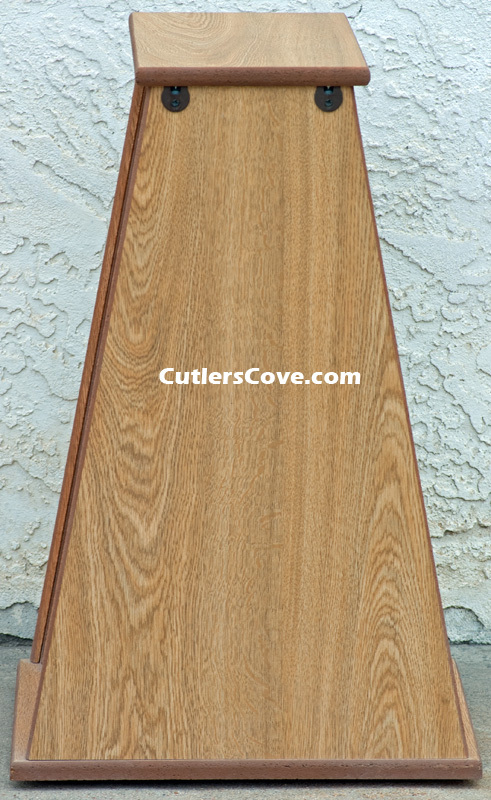 Knife displays are a great way to embellish your space. This will be shipped flat and will require some assembly using a Phillips screwdriver. Shipping this flat will save you money on the shipping cost. Vintage and genuine original Buck knife display from hardware store counter top. Original display from about 1995 that is about 24" X 15-1/4" X 16" on the bottom in excellent condition. A heavy and over size packaging fee applies to this product. $10.00 will be added to the shipping cost.